The Iota Alumni Association received word of the passing last week of Brother and retired Army Lieutenant Colonel Gerald W. Sylvester, recently of Montgomery, Texas. Brother Sylvester was initiated in 1957. He was the big brother of Jeff Allen. His son, Jim, also became a Kappa Sigma at Texas State University (formerly Southwest Texas State), initiated in the Spring of 1983. Brother Sylvester was among a distinguished group of alumni who received Fifty Year pins during the Iota 125th Anniversary celebration in 2011. In recognition of his lifeline dedication and support of the Iota Chapter, the Alumni Association will dedicate our gathering this year to Brother Gerald Sylvester. Alumni Weekend 2019 is scheduled for Friday and Saturday, April 5th and 6th. We received word from Gerald’s family that services will take place on April 6th. As we get further details, we’ll add them to this post. The Iota Alumni Association is proud to announce that current active grand master, Dillon Betros, has been awarded both the Kappa Sigma Iota Endowed Scholarship and the Lori and Erik Harpst Endowed Scholarship. Dillon is a Senior from Cameron Texas and majors in French. The two endowed scholarships have enjoyed generous support from alumni and friends of the chapter. The Association sends a heartfelt thank you to everyone who has contributed to these funds since their inception. The Kappa Sigma Iota Endowed Scholarship goes to deserving students with a financial need and helps cover tuition. The Lori and Erik Harpst Endowed Scholarship goes to deserving students with a financial need and covers the cost of student housing — such as the rent paid to live in the fraternity house. We invite you to make an end of year contribution to either or both of these funds through the Southwestern online portal. To make a donation by mail, remit with specific instruction for either one to: Southwestern University, P.O. Box 770, Georgetown TX 78627-0770. There’s quite a group gathering (and a fun one too) for the upcoming workday at the House. Note: a list of goals for the day and helpful tools to bring will follow this post soon. We encourage all brothers and friends of the chapter to assist in summer house maintenance. In advance of the work weekends, the House Corporation have engaged quality professionals to install a new roof, as well as new gutter screening east side gutter replacements. Having just replaced the 2nd floor HVAC system, the first floor HVAC system will also be done this summer. Join one or both weekends: July 16 or August 6 from 8am to 5pm. Feel free to come down the Friday evening before and join in the prep work. What work can you help with? Landscape maintenance, trimming of trees and bushes, minor repair work to House, deep cleaning to floor restoration and painting/sheetrock work. July 16 and August 6th, 8am to 5pm. If contributions of time and energy are not possible, consider a monetary donation of any amount via Iotachapter.org. Just click on the Paypal link. 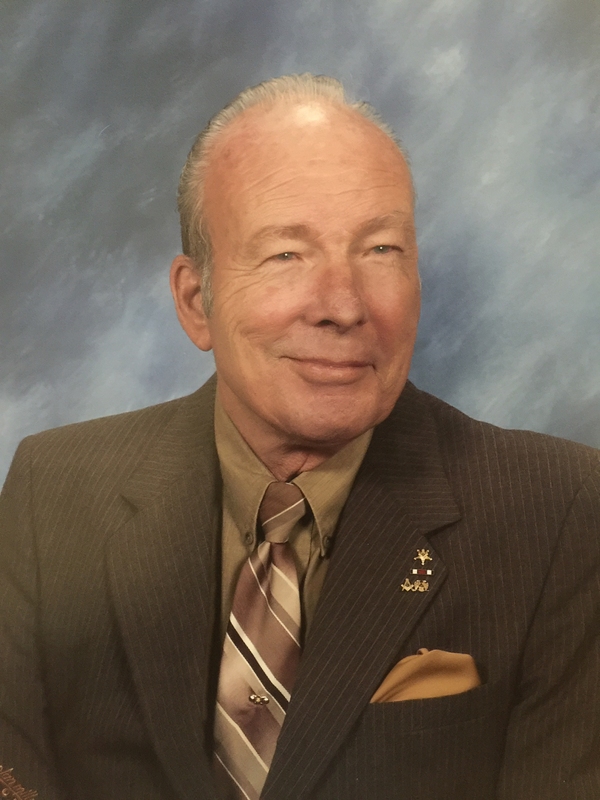 John O. Roark, a distinguished alumnus of Iota Chapter, passed away yesterday. Services will likely be held in Temple, where he lived and practiced law for the past 42 years. A memorial service for Brother Roark will be held Saturday, January 30, 2016 at 1:00 P.M. at the First United Methodist Church in Temple. A reception and visitation will follow the service in the Family Life Center of at First United Methodist Church. Preserving and protecting the parquet floor will be the focus for the first work weekend, beginning this Friday afternoon May 30 and concluding Sunday. It’s a big job. Come lend a hand in the set-up and prep or in the treating and varnishing as you can. All are welcome. UPDATE 10/19/13: The Homecoming weekend football game is against Austin College, not Trinity as previously posted. Thanks for the correction, Brother Tim Stapleton! UPDATE: Homecoming and Reunion Weekend is November 1-3. The Iota Alumni Association will host a tailgate tent ahead of the 1pm kick-off of Austin College vs. Southwestern football game.Â Game tickets are $8 and you can buy them as part of Homecoming registration. New this year for Homecoming is a $5 registration fee. It goes up to $10 soon, so get registered. Visit the Homecoming and Reunion Weekend website to register and answer any questions; and if you still have questions, please contact the Office of University Relations – Alumni and Parents by calling 800-960-6363. A great turnout this year. It was a big surprise. Jeff Allen told the story of the first alumni weekend 40 years ago – way cool and worth retelling. Iota Chapter scholarship report ranks them number one among all fraternities and above the all men’s average. Great work actives! The maintenance fund will provide for a new hot water heater as well as minor up-keep and repairs. Thanks the Spring Class of 2013 for their impartial call of the game. We are planning two work weekends to get the house ready for the fall semester. The dates are July 28 and August 18. We have made so much progress. Let’s keep going. The house looks good but there are things that need to be done. Special thanks to Pat who took the time to put the list on paper after we did a walk through of the house and grounds. 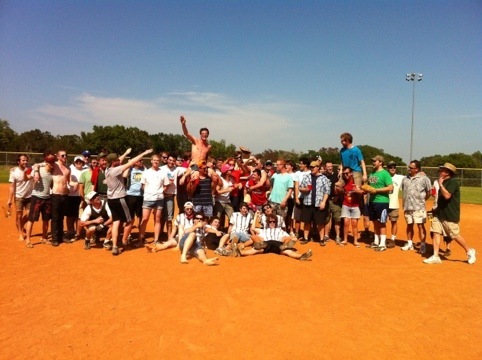 The alumni scored 25 runs before giving up one run to the actives. The streak continues. We are saddened to report the passing of Brother Randy Lankford this past Saturday, February 18th, in Galveston, Texas. As reported in the Galveston Daily News, a Memorial Celebration of Life will be held from 2:00 pm until 5:00 pm Saturday, February 25, 2012 at his residence in Galveston. Georgetown, TX – The Active Chapter has announced that Alumni Weekend will be held over the final weekend in March, the 30th and 31st. The schedule for meetings, softball, and other weekend activities will be announced soon. Save the date! We learned this week of the recent passing of Brother Roger Davidson. Roger was well known and loved by brothers of every generation. Please feel welcome to add your good words to in the comments to this post. I hope this letter finds you well on this October 12, 2011, the 125th birthday of The Iota Chapter of Kappa Sigma. We have a grand celebration planned for the weekend of November 4-6. We are getting concerns and complaints that Iotaâ€™s Celebration is too expensive. We are adding two categories to the registration to make it more affordable. There is no memorabilia included in either one. The alumni â€œBasicâ€ is $85. The guest â€œBasicâ€ is $75. The new registration form has these additions. If you have already registered and have sent in your package and would like to change, let us know and we can do that. Memorabilia will be for sale at the event on a first come first serve basis. Our celebration is 3 weeks away. Southwestern will order food for the banquet depending on the numbers we give them. We will order our refreshments on the same numbers so help us out and donâ€™t delay. I hope this letter will help clarify any doubts and lead to a successful gathering of the brothers and their friends on November 4-6. Events like these come once every 25 years so call your worthless pledge brothers and make sure they will be there. Iota Chapter has a totally remodeled house just waiting for a celebration! Letâ€™s give it one that will be remembered for years to come! The 125th organizing committee and committee member Alan Haworth recently announced Soulhat will play Saturday night at the House as part of the 125th Anniversary celebration.